Last year I planted a lot of vining melons and winter squash in one area of the garden, without any real plan on how I would handle their wandering habits. As it turned out, some of the less vigorous growers got crowded out by their more aggressive neighbors. Hopefully this year I did a better job of planning and planting, and so far the results looks promising. One strategy I tried this year is planting some of the more robust growers in the corners of the garden. That way they could vine up on the fencing that surrounds the main garden area. In one corner I planted the Seminole winter squash, and I set out two plants back in mid May. This heirloom C. moschata variety was grown in Florida by the Seminole and the Miccosukee people, where it was usually planted at the base of a tree. The plant then grew up the trunk and the pumpkins would mature up in the tree. I figured it was a natural for training on the fence. Every time I’m in the garden I work on training the vines to go where I want them on the fencing. I’m trying to get them to go up the fencing so they are out of the reach of the hungry deer and groundhogs. Of course the plants have their own ideas, and latch on to anything they can for support. The Seminole is starting to set on fruit now. You can see the characteristic teardrop shape in the above photo. In another corner I planted the Thai Rai Kaw Tok squash. After planting and mulching with straw, the Thai squash looked like this in May. Eight weeks later it is vining in all directions, and some of the vines are at least fifteen feet long. I have not seen any fruit setting on this one yet. Last year was my first time growing this variety, and most of the fruit set on later in the season. Time will tell if that is typical or not, but it is still early in the growing season. The other vining squash plants were spread around the garden beds and planted where they could easily reach the fence and grab on for support. The Pennsylvania Dutch Crookneck Squash (aka neck pumpkin) is another rambunctious grower. I’ve let it grow up on the fencing for several years now. I did find a young squash on it today. It sort of resembles a young Tromboncino squash at this point, but the neck will fill out as it gets bigger. Last year many of the melon plants got overrun by the vining squash, so this year I was more careful about where I put the melons. I’ve also been training them away from the fencing, as most of them tend to slip off the vine when they are ripe. That is not a good thing if they happen to be several feet off the ground! That’s a Diplomat melon in the above photo, and the yellow color indicates it’s ripening. Diplomat is a Galia type melon with sweet, aromatic green flesh. Despite the green flesh, to me the flavor is more like cantaloupe than honeydew. I’m looking forward to the first melon for sure, and it looks like Diplomat might be the one. I also have Ambrosia, Amy, Brilliant and Sensation melons planted. One of the squash that got overrun last year is Honey Boat Delicata. It was my first year growing it, and we managed to get four fruit from it despite its competition with the other squash. This year I planted it well away from other vining plants, and it is doing quite well. I found several fruit that have sized up and were beginning to turn color, plus more that were just setting on. Baker Creek says this variety is “one of the sweetest squash varieties in existence.” My wife and I both like Delicata type squash, and I am also growing my old standby Cornell’s Bush Delicata as well as another newcomer here called Candystick that Southern Exposure Seed Exchange says is “reminiscent of Medjool dates!” I am always skeptical when I read such hyperbole in a seed catalog, but I am looking forward to tasting these squash. Another vining type squash I’m growing this year is the dual use Mexican heirloom variety Tatume. I’ve grown this one several times in the past, and it is a Cucurbita pepo type that does quite well here. Though you can let the squash mature and use like a winter squash, I think they are best used when young and treated like zucchini. I harvested the first ones a few days ago. 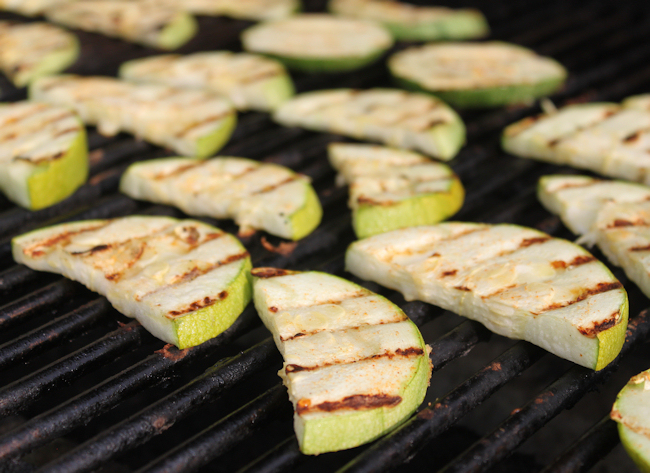 The softball sized fruit are perfect for grilling, and I usually slice them into rounds and brush with a little EVOO then season with salt and pepper. It is usually quite prolific here, and you can see two setting on in the below photo. Hopefully my efforts will pay off with lots of tasty winter squash and melons, and no variety will be left out or crowded out. At least that is my plan! I’ll be back soon with more happenings from HA. This entry was posted in Gardening and tagged cantaloupes, Delicata, Diplomat melon, Seminole, Thai Rai Kaw Tok, winter squash. Bookmark the permalink. So many interesting squash! Sometime I wish I had a bigger garden so that I could try more of the space hogging plants like squash and corn. I’m trying the Candystick Dessert Delicata squash this year also. My plants went from petite little mounds to tentacled momsters in the 9 days that I was away. When I expanded the garden a few years ago, melons, squash and dried beans were all things I added! I’m growing Diplomat for the first time this year. So far I haven’t had any fruit set on any of my melons, but I don’t think it will be long for that. Though it will be a while before I see color like you are. That is a lot of squash varieties! All the cucurbits look great and are light years ahead of mine. I like how you always find room for so many varieties of things. I’ve tried Tatume several times and found it wasn’t living up to hype–maybe it likes hotter weather than here. I suspect you are right about the Tatume. It thrives here in our hot summers. I too say that’s a lot of squash varieties, wish I had room for some. How did “Diplomat Melon” get its name, any idea? Norma, I don’t know for sure about the name. I do know that there was an earlier variety called Passport, and I think Diplomat is an improved version of that with powdery mildew resistance. I’ll be redundant and say – those are a lot interesting squash varieties & they seem to be loving your new arrangement! 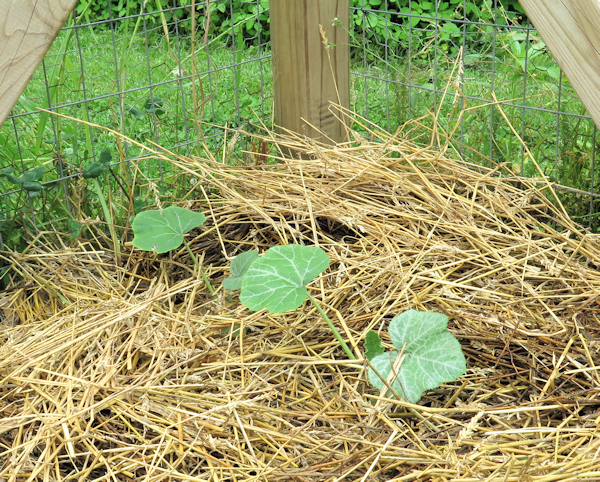 I was really hoping that the straw bales would work as we have a huge area of the backyard that is a veggie “dead zone” because of the septic bed – it would be so nice to be able to use a section of it for sprawling plants like squash. Interesting that the crookneck squash you have grows round then the neck forms. I don’t know what variety I grow of crookneck (comes in a mixed packet) but it starts it’s traditional shape right from the first few inches. The Pennsylvania Dutch Crookneck is sort of like a butternut with an elongated neck. Both the round part and the neck will get bigger around. The Tromboncino neck stays skinny, at least the times I’ve grown it. Can’t believe the size of the flower on the Dutch Crookneck, it’s even larger than the Teksukabotu squash. A strategy I’m trying this year is planting the squash adjacent to the potatoes. When the potatoes come out the squash will be directed into the potato patch. I don’t think that will be enough though, they are already filling up their own bed.